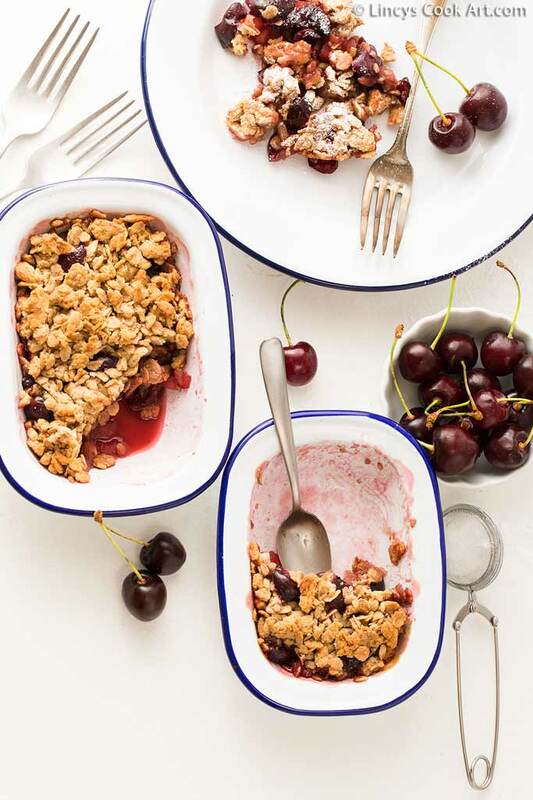 Cherry Muesli crumble is an easy to prepare eggless baked dish, that falls in the category of a breakfast as well as a dessert. 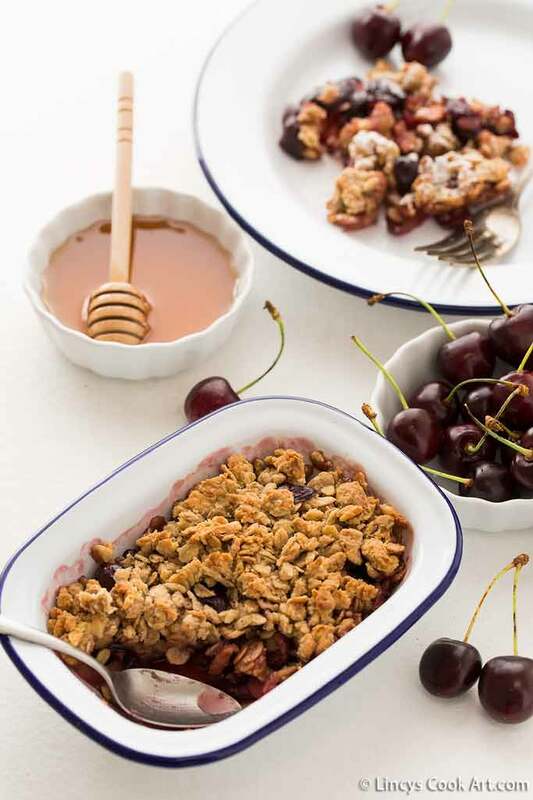 This is an absolutely tasty with fresh fruits and a bit of a cinnamon kick as well as with a crunchy muesli topping. You could prepare this before hand and use it for parties as well as to save time for making breakfast on busy days. Really simple quick and doesn't require any fancy ingredients to make this dish feels like a breeze while making this dish. I have already shared Cherry Pudding (Clafoutis) recipe, Cherry Ice Cream, Cherry Banana Oats Smoothie recipes in my blog 2 years back at my first blog anniversary. 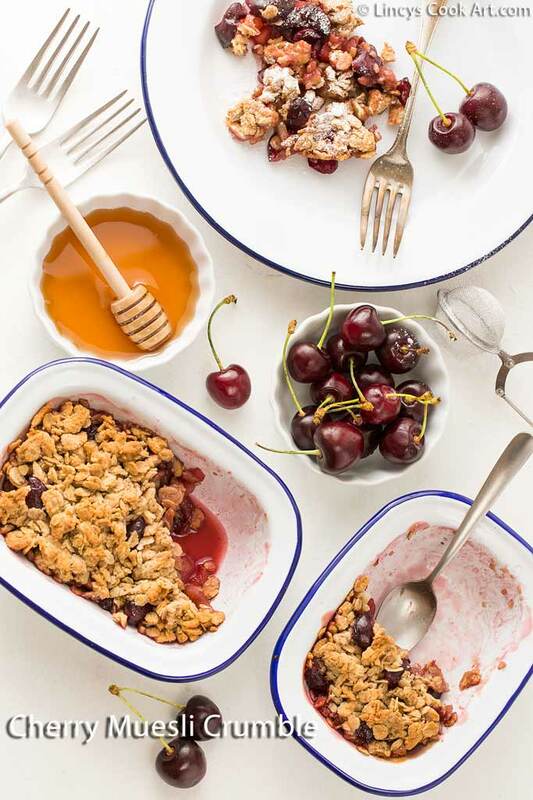 Refer them too and make all these yummy summery cherry recipes at this season! Pit the cherries and roughly chop them. Peel the apple, core it , chop them into small pieces and keep them together in a bowl. Add a tablespoons of honey or brown sugar, cinnamon powder and mix well. In another bowl add the whole wheat flour, muesli, chopped almonds, cinnamon powder, honey, butter or coconut oil and knead with hands to combine well. This mixture should not be too crumbly or too wet. It should be mildly wet. 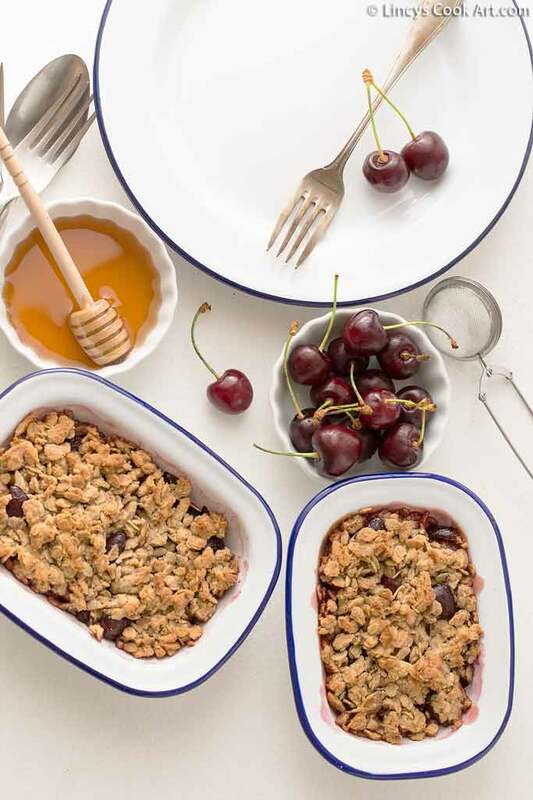 In 4 ramekins or on a large baking pot fill the cherry mixture and then sprinkle the muesli mixture. Keep the ramekins or pots inside the preheated oven and bake them for 20-25 minutes till the top of the muesli starts to brown and crisp. 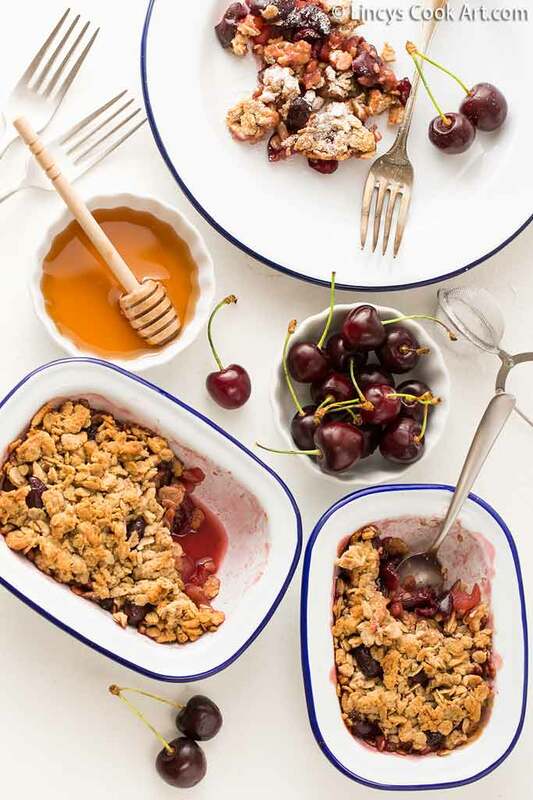 You could make this crumble before hand , refrigerate and reheat and use it on the next day breakfast or dessert for parties. Or serve chilled with whipping cream or topped with ice cream. Adding apple or pears in this recipe is optional but it adds volume to this dish. Whole wheat flour could be replaced with all purpose flour. You could replace honey with regular sugar, brown sugar or maple syrup.